I hope Mary buys it - price is 80.000-120.000 pounds sterling... - but I think she thinks she deserves it. And Marie just had a new tiara. I looove tiaras and the Danish ones are so freakin few and meeeh. why would Mary need a new tiara?? she has 4 for her choosing, and once she becomes Queen Consort she has access to the Crown Jewels. It's Marie that should get another one, one of her own. This one would be perfect for Marie. I agree, and it's an idea you as a Dane could suggest to Crown Princess Mary! That tiara looks much better when its worn just the top part as tiara and the bottom part as a necklace. It's too much stacked up like that. I agree, much better as separate pieces, but as such were probably not majestic enough for a lady-in-waiting to Queen Victoria-Eugenie (or possibly for Madame - can you imagine her parading around in the full kit? ). As an aside, I love reading Geoffrey Munn's informative and enthusiastic description, he's such lovely man and a font of information. This tiara is very much of its time period though, isn't it? It's something I can imagine the flamboyant Marie of Romania wearing. 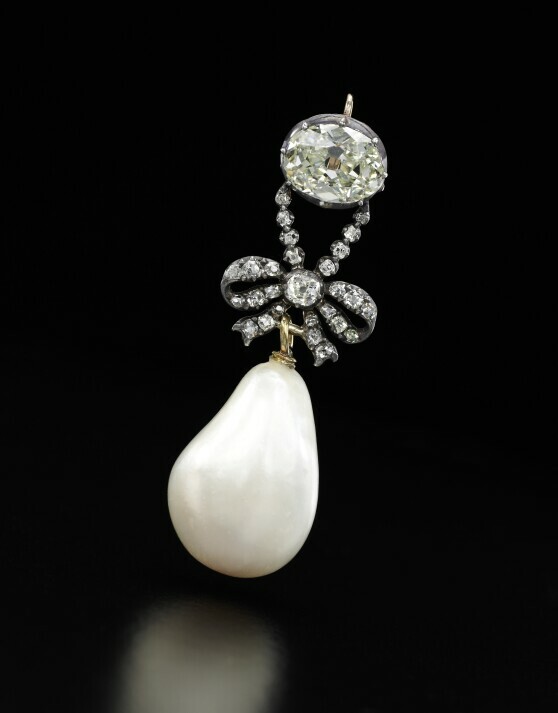 The estimate for this pearl and diamond pendant which once graced Marie Antoinette, is 1 - 2 Mio USD. Some things are really strangely priced. I'd also take the tiara over the pendant and the prices should be more realistic and not blown up because of previous owners. The tiara is really beautiful! 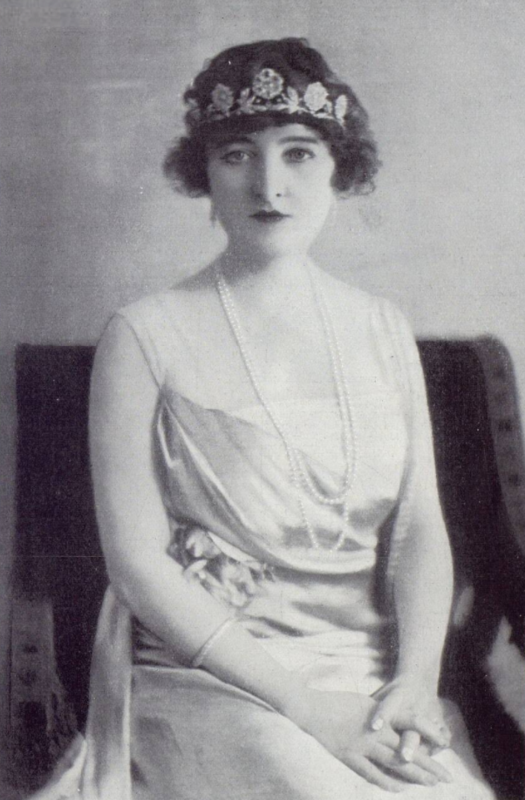 So the woman is Grace Carr Wynn, Lady Newborough, wife of William Charles Wynn, 4th Baron Newborough. They married on 7 November 1900 and he died on 20 July 1916 during WWI. They didn’t have any children so his younger brother, Thomas, became the 5th Baron Newborough. This makes me wonder anew at the often pushed narrative that QEQM was some awe inspiring beauty in her youth. Pretty tiara though!! QEQM was really a beautiful child, but from early adulthood onwards she was incredibly plain. I am quite fascinated that the imo dashing George was so after her (apparently she declined several proposals before she reluctantly said yes!). 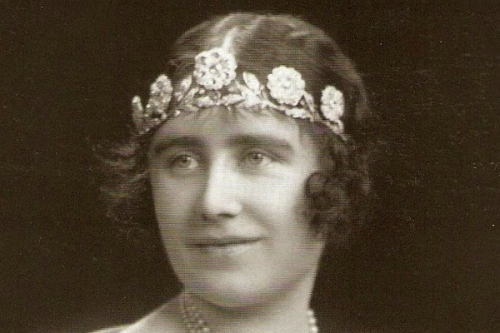 I also never liked how some wore tiaras in the 1920s, like here as headbands across the forehead, but it looks smashing on Grace the 1st owner of this tiara! Her hairstyle is much better than QEQM's and she's very beautiful, carrying this so well. I've heard her both described as a beauty and incrediblely vivacious and bubbly. 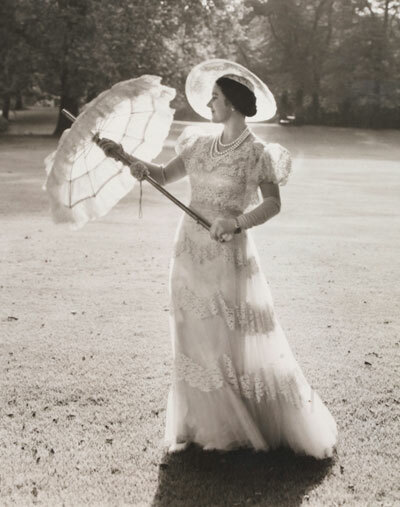 There's one picture of her from the 30's - with a parasol standing by a large urn in the Buckingham Palace gardens that is particularly nice. I just stumbled over the pic you mentioned by chance ... and remembered you mentioned it. That central sapphire is certainly large and spectacular. I like the tiara itself and the diamonds, not so sure it works as a whole piece. I was at Kensington Palace last week and I saw the Fife tiara in person...wow!